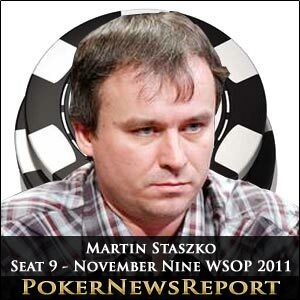 The story of Martin Staszko´s rise into the poker spotlight is every poker player´s dream. Eighteen months ago, Martin was a paintshop worker in a Czech Republic car manufacturing plant, when he took the big decision of becoming a poker professional. With over $100,000 in online poker cashes, it was not a particularly difficult decision to make, but prior to the summer World series of Poker, Martin had only recorded an eleventh placed finish in the EPT Deauville Main Event and a tenth place cash in the Unibet Open in Prague. Martin got in the money in four WSOP bracelet tournaments prior to the Main Event and the rest, as they say, is history. Martin´s route to the top of the leaderboard also makes a great story. At the time the bubble burst on Day 4 of the WSOP Main Event, Martin was down to his last 10,000 chips and had folded 40 hands in a row, just to make sure that he cashed. In the rash of shoves that followed the bubble bursting, Martin came from behind in a K♠ Q♥ -v- A♦ 10♦ race (flopped trip Kings) to bust James Guinther and then turned a full house to double up against Kyle Johnson. At the beginning of Day 7, Martin´s tournament future was saved when he rivered a straight in a three-way pot (after shoving with pocket Deuces) and on Day 8, he eliminated Khoa Nguyen to take a 15 million chip pot with K♥ K♦ against Nguyen´s 10♣ 10♠. What´s Martin Been Doing Since? In a word, resting. Martin attended the PokerStars sponsored EPT Barcelona where he managed a minor cash in a €1,000 NLHE side event, and has been seen on the online poker site with reasonable success. Despite Martin´s limited experience, his chances of still being involved in the later stages of the tournament are good. Martin is a very analytical player and, according to the World Chess federation, has a chess rating one below that of Chess Master. His age and patience should help him to cope with the challenge of going into the final table as chip leader and we believe that Martin will still be there at the climax of the WSOP Main Event on Tuesday. Take a look at our 2011 WSOP November Nine page with all the other November Niners.